The Dulcimerica Video Podcast: TDVP - Episode 132 - "Spirits of Tennessee"
TDVP - Episode 132 - "Spirits of Tennessee"
From July 5th, 2009 - Bing Futch travels through Townsend, Tennessee on two very uniquely different spiritual journeys. With Mike Clemmer of Wood 'N' Strings Dulcimer Shop, a visit to Cade's Cove includes playing mountain dulcimer in a primitive Baptist church. 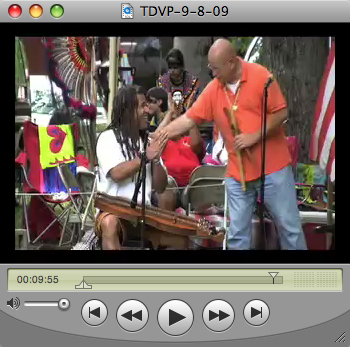 And, earlier, at a powwow, Bing performs "Amazing Grace" with Elvis Two-Sticks in the sacred circle. Elvis might have two sticks, but you two dulcimers! TDVP - Episode 133 - "Nashville NAMM Show"